Growing up in a big family of even bigger soccer fanatics, senior Chantelle Sanchez adopted a passion for all-things soccer and a dream to play soccer seriously at a young age. At about eight or nine years old, Sanchez began practicing competitively at North Huntington Beach Football Club and soon realized her aptitude for the sport. 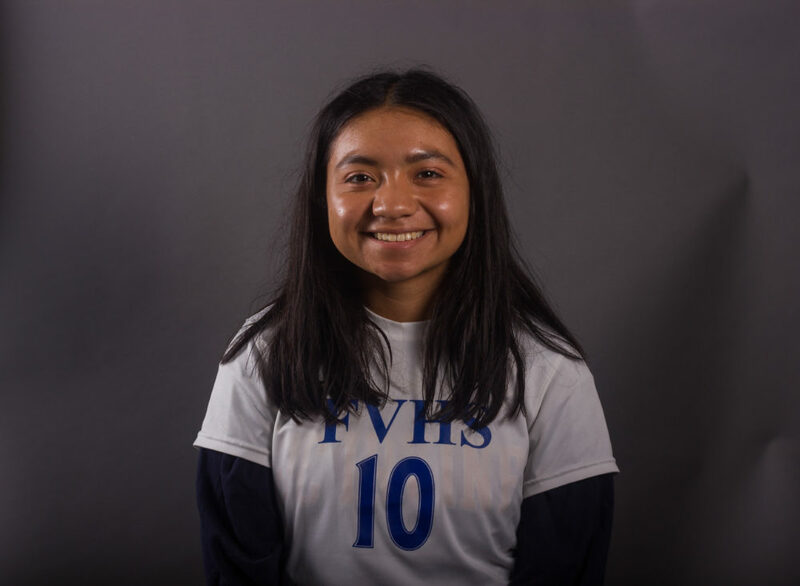 Sanchez has now been playing competitive soccer for almost 10 years at the NHBFC, her first and last club, and has spent her last three years at Fountain Valley High School (FVHS) as a midfielder on the girls’ varsity soccer team — this year as co-captain attacking midfield, she continues to create opportunities for her teammates to score. “What I like about soccer is that it helps me forget about everything else going on around me so whether I’m sad or whatever emotion it is, once I step on the field I just forget about everything and I just focus on that and I have fun,” Sanchez said. Her unwavering love for soccer has kept her resilient through tough times and brought her to higher levels of success in the sport. Last February, she began receiving offers to play collegiate soccer from various schools and in November, she officially committed to the University of California Irvine (UCI) for a spot on the team. Sanchez has high hopes for the future and is gearing up for performance in college. Having watched the team at UCI practice and play, Sanchez intends to fit in more workouts, extra training, and shoot more accurately to prepare for the rigor of the team. Her next obstacle to conquer is a fitness test at the beginning of summer, which will determine whether she receives her gear for games. “I know it’s going to be really hard since it’s Division 1. It’s going to be a job with way older people and it’s intense so I just hope I’ll be able to rise up to the occasion and play well,” Sanchez said. While the Barons’ soccer team has played valiantly in their tournaments this season, they have not done as well in Sunset League. Nevertheless, it has always been a battle to improve after every game regardless of the score for Sanchez. Her favorite moves are scissors, which entail dribbling and feigning to move in a direction, inside-outside, which entails cutting the ball hard, and sombrerito, kicking the ball overhead an opponent. The team attitude, the coaches and the environment of school enthralled her as she leafed through all of her prospective schools, but the deciding factor was UCI’s strong engineering program. “First and foremost, my dream was to play at a really good college too, so I could get [education and training] both together,” Sanchez said. In order to get noticed by colleges, Sanchez had to reach out first and invite the respective coaches to her games. She attended UCI’s ID soccer camp (a camp for prospective athletes to try soccer at the college level) and caught the attention of the coaches with her exceptional performance. She continued to put herself out there with her participation in the Olympic Development Program, where she continued to talk to coaches and make connections. With the confidence and skills soccer has given her, Sanchez is taking the future shot by shot, goal by goal.